Chicago, Jun. 2014: John Preus doesn’t take summer vacations. This time last year he was serving as the project lead on the monumental house-swap that was Theaster Gates’ work for documenta 13. 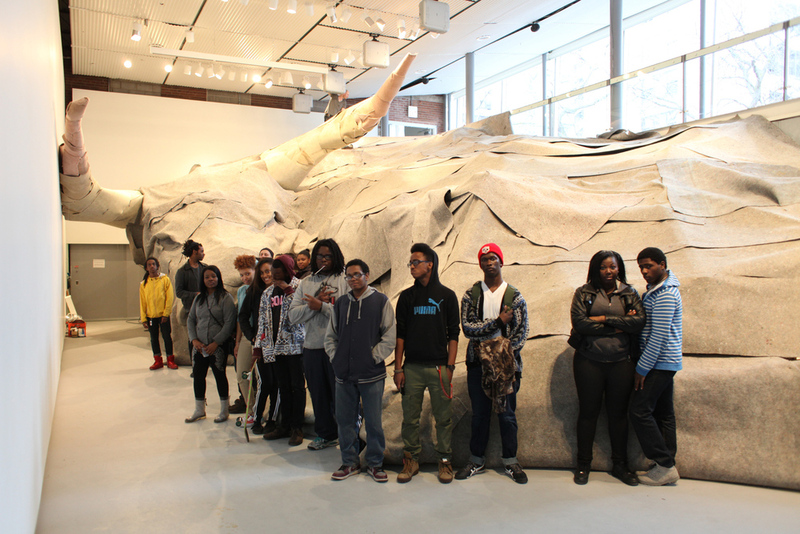 This year, back in Chicago, he’s just opened a massive solo exhibition at the Hyde Park Art Center (HPAC), is a recent recipient of a Maker Grant, awarded by the Chicago Artists Coalition, and thanks to a partnership with the Graham Foundation, has organized a huge conference and workshop intensive on public space. 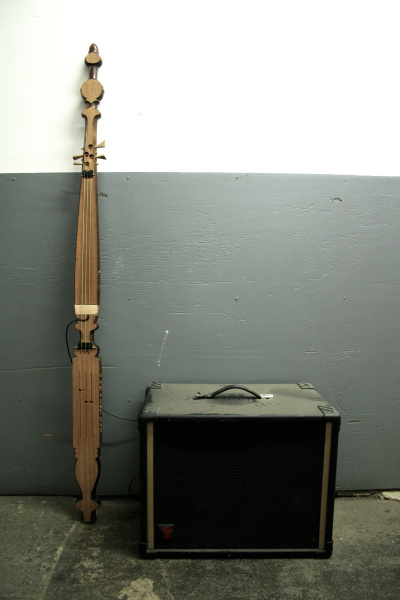 He also operates Dilettante Studio, a design/build workshop, collaborates on the Southside Hub of Production, a roving, socially engaged arts group, and plays music with his band New Material. As if that didn’t keep him busy enough, his show at HPAC, entitled The Beast, is a massive built-environment piñata stuffed with art objects. There’s also a continuous stream of concerts, lectures, and classes scheduled for the various spaces inside of it, including potlucks, breakdance battles, and yoga, but, as he discusses below, some of his favorite activities have arisen from the serendipitous usage of the space by others in un-programmed ways. Stepping into The Beast is like going down the rabbit-hole to Wonderland. From the outside, it seems much smaller, and muted by sleep or death. Inside it’s brightly lit by flood lights strung from the arched masonry overhead. A winding path of inlets, bump-outs, and cubbyholes terminate at the windowed garage doors that serve as part of the art center’s exterior wall. When the doors are open, it’s not unusual to see kids whizzing in and out shouting, find an out-of-sight viewer upstairs reading, or spot teenagers noodling on the chair swing. There’s a moment of confusion when you step back out onto the sidewalk and into the surrounding neighborhood though, because you realize that rather then bring everyday life into the art space, Preus has pushed art out into the everyday world. 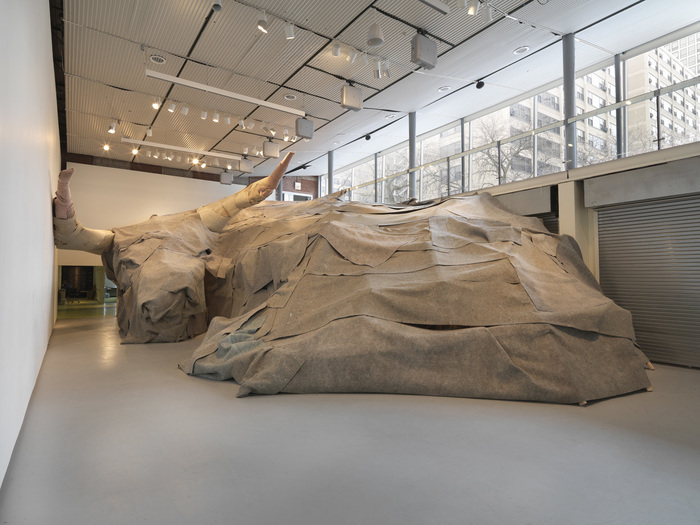 John Preus, The Beast, installation view, Hyde Park Art Center, Chicago, 2014; Photo courtesy of Tom van Eynde. John Preus: The residency allowed me to learn more about the social dynamics at HPAC, the way the spaces are used, who uses them and for what… The image of the beast was specifically conceived in relation to the space—the garage doors, the balcony, the scale, the various entry points, the proximity to the sidewalk outside, the ways in which it is both an art and community center, the fact that it invites an array of public interactions and energies unlike a gallery or museum space, which has a much more sacred and austere sensibility. It also afforded me a closer look at the administrative workings, the nuts and bolts of how a community art center works, all of which has been a great learning experience. They have a great team at HPAC that I feel privileged to know, and sing their praises every chance I get. TLN: From the outside, The Beast appears raggedy, drooping and docile. Once you enter its body cavity, either through the neck or the belly, it’s clean, bright, taught, and impassioned. What are the materials used to construct it and how do they impact its physical presence? JP: The felt hide is carpet padding that I collected from the dumpster of the high-rise building a block east which was being remodeled. The felt is in part a Beuysian riff, and the idea of warmth and protection that it symbolized for him. In The Beast that has to be read against its history as discarded carpet-padding in a high-rise building on Chicago’s south side, where protection and security are sorely lacking, in large part related to the governing ideology of the bull market. The sheer scale and amount of felt also complicates the association with Beuys, who referenced it largely as a personal symbology, and makes of it a more collective association. It is also found felt—synthetic, unnatural—in the form of industrial-scale waste, which I imagine as a challenge to the personal moralism that drove some of Beuys’ work. The heavy draping of the felt feels solid and impenetrable, but The Beast creates space by taking space. The interior feels much bigger than it should when seen from the outside. An interesting development has been that Hyde Park high school students have taken it over as their drop-in hangout, in addition to the programmed events they lead. It’s become where they meet after school, or go when there isn’t anything to do. So a literal pile of garbage has become a temporary respite from the de facto criminalization of adolescence by virtue of the fact that there are so few places to go where they are not considered a nuisance, a danger, or a liability. In my view, this spins Beuys’ idea of the warmth and protection capacity of felt into some strange collective territory that I am trying to articulate. The interior spaces are all lined with tabletops collected from the closed Chicago Public Schools (CPS). The swing was made from two modified CPS desks and chairs. Maybe these can be read as charged particles that passively record the history of their use, which continues to radiate out of it at different rates and times…collective memory zip drives. I am thinking of the bull as a Western totem animal (bull market), meaning that its powerful dignity is conjured as a governing impulse underlying our socioeconomic trajectory and value structure. That is conflated in The Beast with the history of the bull as both a sacred and sacrificial animal (Spain, India, Chicago slaughterhouses for beef production…). I am interested in how violence and the sacred are so often related, and what that says about forms of socioeconomic organization. So the use of the CPS materials is premised somewhat on the notion that it is emblematic of the socioeconomic and political fallout (sacrifice) of neoliberal capitalism, that there will always be pockets of the displaced who have no political agency, and upon whom policy is enacted. So, if there is a working hypothesis, maybe it is that the logic of the bull market remains adversarial, antagonistic, sacrificial, and ritualized. I want to explore the premise that it is through an acknowledgment of shared vulnerability that love, and by extension social cohesion, is possible. I also imagine the material as a sort of catalogue of divestment. How deep is the divestment in the public sphere if we take the schools as an example? We are in the midst of a broad transformation in the idea of the public, whether or not it is conscious. Schools are being transferred to private ownership, city services contracted out to corporations, the global security apparatus is being increasingly privatized, all under the assumption that economic incentives will beget justice. We vote for leaders that then subcontract out the responsibilities of leadership. I don’t think that is a winning recipe for representative government. The recent closing of the schools is a major social upheaval whether or not one agrees with the professed justifications. Where/how can these sorts of things be processed in a public forum? How might the presence of the material, and the framework of the carcass inflect the kinds of things that happen inside the space? 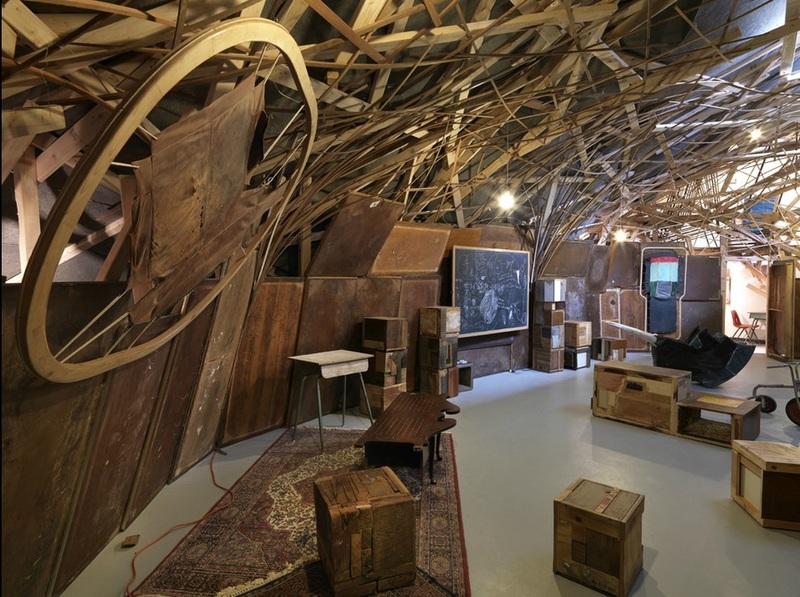 John Preus, The Beast, Interior installation view, Hyde Park Art Center, Chicago, 2014; Photo courtesy of Tom van Eynde. TLN: I know The Beast went up in roughly 10 days. How long was the concept in the making? TLN: In contrast to the immortal, position-taking, individual genius of much architecture past and present, The Beast functions in completely opposite ways—it’s a mortal thing, or sacrificial beast as you allude to, a free space, and designed, constructed, and programmed by you in concert with a whole host of collaborators. Can you say more about some of these dichotomies and how you hope they’ll shape viewers’ experience of the project? JP: How might architecture be understood less as an assertion of immortality, and more as a collaboration with existing conditions and processes? Is it possible for space to speak of absence? Instead of asserting itself into open space, The Beast becomes a void, a public pocket carved out of the given landscape, out of the materials that were already there. It is a sort of visual pun, playing on the paradoxical aspects of presence and absence, both of spectacle and modesty, a thing and a no-thing, a hill and a hollow, a cathedral fashioned from the bones of an inherited carcass. Or maybe a figurative monument to the cost of presence. In a way it literalizes what all buildings are—dead space. What are the features of public space that could accommodate a wider range of collective emotions? Social life is a kind of masochism. To care, to love, to be concerned, has the effect of eviscerating us, of splitting us open, of spreading ourselves out into the world. Our identities are progressively riven and scattered, and the parts can’t be put back together. And it hurts. As Judith Butler says, “we are held in thrall by the Other.” So, to talk about community, though there is a great deal of joy in it as well, is to open oneself up to pain and suffering, and to embrace the certainty of suffering. In so doing, you become vulnerable. So The Beastexplores these dimensions of vulnerability, grief, mortality, that I think are the basis of the possibility of social life. I wanted to consider what a tragicomic architecture might look like. Rather than the generally triumphalist heroism that most architecture embodies, what would an architecture of grief, insecurity, longing, absurdity, or uncertainty look like? The figurative aspect is maybe an attempt to acknowledge that architecture has a story that is implicit in its existence, of massive scale ecological and social displacement. I went to an evangelical Christian high school which turned me off to religion of any form for many years, and the type of evangelism I saw there started to cast missionary work in a sinister light. The troubling colonialist implications of missionary work became an embarrassment, and I referred to my parents as teachers rather than missionaries. They taught at an established ecumenical seminary in Makumira, Tanzania, so whatever savage soul-saving had happened was by then institutionalized. As a kid I experienced our time there as a child experiences anything, with equanimity and acceptance. Maybe there are ways in which how I think about power, difference, race, and colonialism somehow relate back to those experiences, but it would be hard to quantify except as a somewhat heightened sensitivity to power dynamics. Maybe my feelings for garbage are atavistic missionary impulses. TLN: How would you judge your success in addressing some of these issues with your project? I ask because I bring some skepticism to similarly positioned “social practice” works, and I want to push you on this point of spectacle, and how it co-exists with the other really heavy, intensely felt and meaningful issues of sacrifice, grief, and individuation versus collectivity. JP: I probably share your skepticism about aspects of social practice, and welcome whatever skepticism you might have about The Beast, and my motivations. I would be interested to hear what you would consider similarly positioned works. TLN: I’m thinking of local projects that have a similar focus on exhibition as programming, but their methodology seems to be “throw it at the wall and see what sticks.” Rhizomatic or generative exhibition making is valuable, but I also think that exhibitions tell a story, and that we, as makers and curators, are the only ones who know that story, and it’s our responsibility to translate it for others in a more holistic, metabolized way. JP: My first stab at an answer is to plead ignorance. The Beast is an image, a small gesture, a longing of mine expressed in physical form for a species of public space and public thought that doesn’t exist yet, or exists in parts in other places. First and foremost, it is me thinking/feeling out loud. If your question is about efficacy, I am inclined to avoid it because I don’t have the equipment to respond to that with any accuracy except my own observations, and things I have heard from other participants. It has been an ambitious project, with lots of activity, and it is right that we should wonder to what end all of this activity is directed. I have said a fair amount about my own wishes, and I suppose the success of the project is measured to some degree in how distinctly my own personal questions resonate in the public sphere, and in the art world at large. My reference to the spectacle is partially a question about the relationship between the image and social identity. In a world mediated by images, an understanding of their attributes, powers, and magic is critical. It is tempting as an artist, especially in academia, to drift further into the esoteric realm of images, into a conversation with fifty other people, which can be hugely valuable. But how do you leave a trail of breadcrumbs? Academia is, in a sense, an instantiation of the minotaur myth, in which you are eventually consumed by the image you went to kill unless you leave a thread to get back out of the labyrinth again. The Beast in a way literalizes how I imagine the relationship to work. We consume images, and they consume us. We create lenses through which we look at and understand the world, and are consumed by those lenses which become reality. I consider it a great success that it has become the high school hangout, and a venue for all manner of public meetings and conversations, that it has created a somewhat novel form of reflective behavior, unlike others that I have experienced, a combination of wariness, delight, adventurousness, speculative ripeness, a willingness to venture big ideas. But maybe it is, by and large, a form of what Simon Critchley calls “mannered situationism,” which describes the limits of theater, and the lot of all art world versions of politics, which brings us back to Debord and the spectacle. I think of it as a spectacle in the sense that the Trojan horse was a spectacle, a decoy appearing as a gift. But there are many ways to think about a decoy. An icon is also a decoy, intended to project a reality beyond the surface of the image. It works to the degree that it seduces your attention, but then becomes a lens beyond the surface of the image. Modernist painting was in part an iconoclastic discourse about where the surface of the painting begins and ends, but it certainly did not dethrone the image of its mythic powers. Many of the issues raised in the context of The Beast are conversations about the entanglements of myth and pragmatism, and how myth congeals into social policy. ArtSlant would like to thank John Preus for his assistance in making this interview possible.